Prestigious A3 Flying Scotsman is back on mainline service and I was fortunate enough to have a 110 mile trip around the Cathedral Express Estuary Circular Route. The clockwise journey takes you along the old Gloucester to Cardiff line and is full of picturesque scenery and of course views over the Severn Estuary. Flying Scotsman was pulling a fine rake of 8 mixed coaches including 2 Pullman cars for those looking for the fine dining experience. The trip took a little over 4 hours and was pretty much enjoyable from beginning to end, including the smoke filled coach going through the Severn Tunnel! What was magnificent was the acceleration and smooth running of the ‘Scotsman” – what a superb job they must have carried out on the rebuild. I have to say the day was over all too quickly. I have to thank my good lady for a great birthday present! The first trains only travelled slowly and ran infrequently, so initially no signals were necessary and the Companies relied on the trains being adequately spaced by a generous timetable. If a train broke down then the guard had ample time to go back down the line and warn the next train of the danger. When the speed of trains increased and they ran more frequently, a more positive approach had to be taken. Trains were then kept apart by a time interval. A “policeman” ensured that a train would not depart from a station until a suitable time interval had elapsed after the departure of the previous train. To this day signalmen are called “Bobbies” by the engine staff. Initially these “policemen” used hand signals, but then fixed signals were erected with arms to indicate the same as the hand signals had done and they were easier for the poor “policeman”. The first of these semaphore signals was erected at New Cross station, London, in 1841 AD. This system of hand (or similar) signalling was fraught with danger as a fast train could catch a slower train up, and if a train broke down then the guard could no longer warn the next train because it was coming along too soon behind. So they developed a system that a train could not leave a station until the previous train had reached the next station. This could only be achieved after the electric telegraph was introduced. Signals were originally worked from the base of the signal post, but then all the controls were concentrated in a signal box, and the points and signals were interlinked in the boxes so that conflicting signals could not be given. The signal boxes were connected by electric telegraph, and the railway lines between stations were divided into blocks; the station itself did not form part of the block and that section was called ‘station limits’. The rule was that only one train could occupy a block at any one time, and this was achieved by the signalmen giving a code of bell signals to each other over the telegraph system to say if a train was approaching and to ask if it could be sent ahead, or then to say that it was in the section (block), and finally to say that it was leaving the section. These bell codes described the train as “passenger”, “freight”, “express” or “slow” etc. The distance between signal boxes was initially determined by the length of the rods to control the points that a signalman could operate easily. This was set at a maximum of 350 yards. This problem was overcome by installing power operated signal boxes, where the points were operated electro-pneumatically, so now signal boxes were placed further apart. The braking ability of the first trains was very poor and they could not easily stop at a signal at danger, so an advance signal was introduced called the “distant” signal to warn drivers of the condition of the next signal in case they had to stop at it. After many experiments distant semaphore signals finally had a yellow arm with a black chevron band and a “V” shaped notch at the end so that they could be easily identified from a distance. At night the system that was finally adopted was that distant signals showed a yellow light when the signal was set and a green light when the line was clear. The signals at which a train may be required to stop had red arms and a white vertical band with no notch at the end. The signal arms were horizontal when in the danger position, but they rose 45o on LMS lines when there was no danger, and these were called “Upper quadrant” signals. On the GWR the signals dropped 45o when there was no danger, and these were called “Lower quadrant” signals. The LMS considered that upper quadrant signals were safer as the signal arm dropped by gravity when there was a fault, while lower quadrant signals had to have a counter balance weight to bring the arm up to the ‘danger’ position. Stop signals showed a red light at night when the train had to stop and a green light when the line was clear. The sequence of the signals was that a “Starting” signal was positioned at the beginning of a block, and a ”Home” signal was positioned at the end of the block. There was an overlap space between the blocks that gave breathing space for shunting, and small calling on signals were positioned low down on the signal post to allow shunting trains to move a short distance past a signal at danger. This overlap space fell between the home signal of one block and the starting signal of the next block. If there was a station then it was positioned in the overlap space and this was called the ‘Station limits’. To help the driver a repeater signal was sometimes provided at ground level. This consisted of three lights; the lower two were red and the upper one was white. The white light lit when the signal was set clear. In addition, there were colour light signals or discs at ground level to indicate the setting of any adjacent points. Also, shunting signals were provided at ground level. These also had three lights; the one on the bottom left was red, while the one at the bottom on the right was white, and there was another white light above the red one. If the two bottom lights were alight then it indicated stop. If the two white lights were alight then it indicated shunt forward. The running sequence was that the signalman would ask the signalman in the next box if the line was clear, using the bell signals. These were in code to indicate what class of train was coming (e.g. 4 bells = express passenger, 3 bells pause 1 bell = ordinary passenger train etc). If the line was clear then the second signalman acknowledged the request and he set the handle of his block instrument to indicate “Line clear” in both signal boxes. The first signalman then cleared his starting signal, which allowed the train to enter the section. At the same time he sent the bell code “Train entering section” to the next box. The second signalman then set his block instrument to the “Train on line” position. The same procedure was now repeated by the second signalman as he called the next box down the line. As soon as the train had passed the starting signal of the second block the first signalman set his Home signal to danger and sent the “Train out of section” bell code to the previous box. Additional trains could be accommodated on the line if an intermediate block section was inserted between block sections. Ladies may also be employed on the railway, even though I say signalman. A safety system was introduced called a “track circuit”. An electrical connection was made to the two running rails so that when a train was on those rails it completed an electrical circuit through its wheels and this warned the signalman that a train was in his section (it “failed safe”, as all railway equipment did, as the circuit was switched off by the presence of the train). A white diamond shaped disc was fixed to each signal post to indicate that the track was protected by a track circuit. A problem with track-circuits is that leaves on the line, or oil dropped from Diesel locomotives, insulates the track and the signalman is not aware that the train is on the line. The trains must then be stopped until the line has been cleared. Various other safety devices were invented to give the driver an indication in the cab of the condition of the signals, such as the Raven, Reliostop, Sykes, Angus, Hudd and the GWR ATC (Automatic Train Control) systems. In the ATC system a ramp was placed before the signal, which engaged a shoe on the engine. If the signal was at caution or stop, then the ramp was dead and it lifted the shoe, which completed an electrical circuit in the engine and sounded a horn and applied the brakes. If the signal was clear then the ramp was electrified (16 volts negative dc) and this voltage over-rode the shoe contact and sounded a bell in the engine cab. It was a fail safe system, but the driver acknowledged it by over-riding it so that he regained full control. There was also an indicator in the cab to remind the driver of the signal condition, and this system was particularly helpful at night or in fog. On single lines the train may be travelling in the opposite direction, so the indication did not apply to it, and the ramp was charged electrically positive with respect to ground to inhibit the indication. On single track lines the driver was given a token by the signalman and the signalman could not change the signals to allow another train to enter the section until he received the token back again. The ATC system has been taken a stage further as nowadays it is considered undesirable to have a system that includes mechanical contact, so the AWS (Advanced Warning System) has been developed and is now used extensively and exclusively (but not everywhere!). In this system two magnets of opposite polarity are placed between the rails 200 yards before a signal. One of them is a permanent magnet, and the other is an electro-magnet. There is no mechanical contact between the engine and the magnets. The permanent magnet sounds a warning horn in the cab when the train approaches the signal, and it also turns a disc in the cab black. If the signal is at danger or caution (red, yellow, or double yellow – see below), then the electro-magnet is not energised, the disc remains black and the horn continues to sound. However, the driver can cancel the warning within 3 seconds and the horn is then silenced and the disc turns black and yellow to remind the driver that he has cancelled an AWS warning. If the driver does not cancel the warning within the time limit then it is too late to cancel it and the brakes are applied automatically. If the signal is at clear then the electro-magnet is energised and it switches off the warning and sounds the bell in the cab and cancels the disc indication. It is a fail safe system as the electro-magnet has to be energised to indicate clear. AWS has a number of drawbacks; for example it does not distinguish between ‘caution’ and ‘stop’ indications. The latest device of this type is the TPWS (Train Protection and Warning System) which has been installed, initially at high-risk locations, but later as standard. It consists of a transmitter beside the stop signal, which is active when the signal is at ‘red’, and this applies the brakes on the train automatically and cannot be over-ridden. Another safety device is a box fixed to the rails to determine whether an axle is over-heating. An over-heated axle would eventually cause a wheel to disintegrate, which would result in a derailment. Yet another safety device counts axles as they pass. A similar device further along the line does the same thing and compares the result with that obtained from the first device. If the results differ then the train has split and the signalman’s attention is drawn to the fact that carriages or trucks are loose on the line. In the early days each signalman had to ensure that a red light was alight at the back of the last coach or truck, to confirm that a train was complete. Axle counters can be used to tell the signalman that a train is on the line, and they are more reliable than track-circuits as they are not affected by fallen leaves, so axle counters are now replacing track circuits. They can, however, get out of phase and then they are useless, and they do not detect broken rails, and the staff can no longer short circuit the running rails to warn of danger as they could in the past. Radios overcome this latter problem, see later. Nowadays semaphore signals (the type of signals described so far, as they have arms) have been superseded by colour light signals. The descriptions that follow refer to main line railways in Britain. The London Underground, the London Mail Railway, the Metro, the Dockland Light Railway etc, all have their own individual signalling methods. The main line colour light signals show red for danger, yellow for caution and green for clear. The yellow light takes the place of the old distant signals. On busy lines the signals have two yellow lights. If they are both alight then the next signal is at yellow, and the one after that may be at red. If only one yellow light is alight then the next signal may be at red. In the old days they had a semaphore signal arm for every branch off the main line at junctions, and the main line signal posts were higher than the branch line signals. This meant that a driver passed signals at danger for routes that did not apply to him, and accidents have been caused because a driver misread the signal intended for him (e.g. at Norton Fitzwarren in 1940). With modern signalling there is just the one signal with a row of lights to indicate which way the points are set, or even some other visual indication such as a letter, a word or a number. Now there is only one red light and there is no confusion; a red light means stop. On open stretches of line the signals can work automatically, turning to red after a train has passed, then to yellow, then to double yellow and finally to green as that train passes successive signals down the line in turn. High speed trains have introduced another problem, for they need a warning over a longer distance than a slower train does if points are set to a diverging route. The double yellow therefore flashes, followed by a flashing single yellow, followed by a steady single yellow then the red signal. This is preferable to the previous system whereby a signal was held at red until the train speed had been reduced to a figure that was safe for the turn-out, before turning to a proceed aspect. Drivers knew that it was a “controlled approach” signal and assumed it would always eventually turn, but were caught out when the signal stayed red because of an obstruction and many accidents were caused because the driver braked too late. On very high speed trains (140+ mph) they have added a fifth aspect, which is flashing green. Mechanical signal boxes have been replaced by all-electric signal boxes, which are spaced much further apart than the mechanical ones had been and the signalman can no longer see all of the track that is under his control. So a track diagram is put in the signal box and this gives a diagram of the track and shows the condition of all the signals and points controlled by that box, and also the presence of any train that is in that area. Nowadays an indication is also given on the diagram to show what class that train actually is. A typical description would be 1A20, where “1” indicates an express passenger train, “A” indicates that the route is the East Coast main line, and “20” is the serial number of the train. Modern signal boxes enable the signalman to set the route merely by pressing a button on the diagram at the starting point of the required route, and another button on the exit point of that route. This automatically sets the points and the signals to give the desired route. This system is known as an NX (eNtrance-eXit) system. The most modern installations automatically set the route from the Train Indicator number, and the signalman does not have to do it. He is there, however, to make any changes that become necessary if a train is running late, or if an extra train has to be fitted in. An alternative to the NX system is the OCS (one-control switch) system, in which the signalman has a switch at the entry point of each route and he can turn the switch through as many positions as there are exit routes available, to a maximum of eight, and he selects the appropriate route by turning the switch. If the track circuit indicates that the route is clear and that conflicting signals are not being set, then the points are set for the selected route and the signals are turned to ‘clear.’ Interlocking, to ensure that conflicting signals are not set up, was originally done mechanically at ground- level in the signal box, but in an all-electric signal box the interlocking is done by electrical relays. Relays have now been replaced by micro-processors giving solid state interlocking (SSI), but these in turn have been replaced by computers giving computer based interlocking (CBI). Computers record all that is happening and ensure that the routes that are set are not conflicting, and they are housed in Integrated Electronic Control Centres (IECCs). The systems are installed in duplicate or triplicate for safety reasons, and two of the three computers have to agree or the signals will be set to danger. Initially visual display units (like television screens) were installed to take the place of track circuit diagrams, but these caused eye strain and in the latest installations the track circuit diagrams are back again. In the early days a driver could contact the signalman by using a telephone attached to the signal post. The drivers are now supplied with two-way secure radios, so that not only can the driver contact the signalman, but also the signalman can contact the driver. Four bad accidents were caused by a train passing a signal that was set at danger. At Harrow & Wealdstone in 1952 an express ran into the back of a local train and another express coming on the opposite line ran into the wreckage. In December 1957 at Lewisham a steam train ran into the back of an electric train in dense fog and brought down an over-head bridge that had a train on it, which added to the carnage. In September 1997 a passenger train travelling at 125 mph crashed into a goods train that was crossing its path at Hayes. The passenger train driver missed a double yellow signal and could not then stop in time when he saw the next signal. The passenger train was fitted with ATP and AWS, but the systems were not working. In the old days passenger trains always had priority and no-one would have allowed a goods train to take precedence. Then in October 1999 a Thames train passed a signal at danger, and because the points were not set for it, it travelled down the main line in the wrong direction and had a head-on collision with a Cheltenham train at Ladbroke Grove. In those old days catch-points would have ensured that the train could not get on to the main line while the signal was at danger, but these are no longer installed due to the extra cost. Trains in France run at up to 200 mph. Eurostar trains have to conform to French signalling with in-cab radios and displays, which use the TVM430 system. In France there are no line-side signals, but in England there are, which duplicates the control method, but it conforms to the system used over here. In America, where much longer distances are covered, the position of the trains is determined by satellites, but that has not come to Britain yet. Before the railway age the journey from Birmingham to Bristol by canal took one week, while that journey by road could take up to four days. It is no wonder that people were delighted when the railways arrived, as so much time was saved and the journeys were so much more comfortable; the degree of comfort depending upon which ticket you bought, as there were 1st, 2nd and 3rd Class seats. One of the earliest lines to be laid in this area was the Bristol to Gloucester Railway, which was opened in 1835 as a mineral tramway. This was a standard gauge line (4’-81/2” between the rails) that was horse drawn and was built specifically to carry coal. Another early railway was the Birmingham and Gloucester Railway (B&GR), which was completed in 1841. This railway had a terminal station in Gloucester where the car-park is today. This line was also standard gauge, and it had a station at Lansdown for Cheltenham which was opened on 24th June 1840 when the Birmingham line had not been fully completed. The width of the standard gauge was chosen because horse-drawn carts were 5 feet wide (governed by the width between the shafts), so they made carriages 5 feet wide (as they were initially horse drawn) and that resulted in the wheels being 4’-81/2” apart. Both of the above lines were short lived because in 1845 they were combined to form the Bristol to Birmingham Railway. That in turn was short lived because in 1846 it was taken over by the Midland Railway. The Midland railway entered Gloucester with a level crossing at Horton Road, then came the station, then the line went around the Tuffley loop with a level crossing at Barton Street and continued southwards. Cleeve Station was on the Midland line north of Gloucester; it was near the present council tip on the Stoke Orchard Road, about a mile from Bishop’s Cleeve (so named because the Bishop of Worcester owned the Manor of Cleeve in the 10th century; his summer palace was where Bovis Homes now have their headquarters opposite the tithe barn). Meanwhile Isambard Kingdom Brunel built the broad gauge (7’ ¼” between the rails) Great Western Railway (GWR) from London, Paddington, to Bristol. This reached Maidenhead in June 1838, Reading in March 1840, Swindon in December 1840, and Chippenham in May 1841. At the same time Brunel’s assistant started from Bristol working towards London, and he reached Bath in August 1840. He then had to excavate the very difficult Box tunnel, where 100 navvies died doing the work, and the line was opened in June 1841, giving a route from London to Bristol that was covered in 4 hours. A refreshment room was built at Swindon in 1842, the first of its kind, and it was divided according to class. All trains stopped at Swindon to change engines and there was a further requirement that all passengers had to partake of refreshment before the trains were allowed to continue. A broad gauge line was built from Swindon to Kemble, together with a branch from Kemble to Cirencester, both of which were opened in 1841. That line was extended to Gloucester in 1845, with a station at Stroud, and then broad gauge on to Cheltenham, where it terminated at St. James’ station. The station at Gloucester was a new through station on a site that had previously housed the Midland Railway engine shed; it was called Gloucester and was opened on 12th April 1896. The line from Cheltenham to Swindon was known as the Cheltenham and Great Western Union Railway (C&GWU) and it was mixed gauge between Cheltenham and Gloucester where it ran with the Midland Railway. The C&GWU had been absorbed by the GWR in 1843. Gloucester was a gauge-change station as passengers and their luggage had to move from a broad-gauge train to a standard-gauge train to continue their journey to Birmingham or Bristol. However, by 1892 there were more standard gauge lines than broad gauge ones and the Government ordered all broad gauge lines to be converted to standard gauge. It was in 1899 that the GWR built a branch from Kemble to Tetbury. The GWR continued from Bristol down to Devon and Cornwall, which earned GWR the title the Great Way Round, in addition to God’s Wonderful Railway. It was many years before the short cut through Westbury was built. Railway lines were built in the Cotswolds in four stages. First came the Chipping Norton Railway which ran from Chipping Norton to Kingham, and was opened in 1855, where it connected with the Oxford-Worcester and Wolverhampton line (the OW&W line), and therefore to London. This line was colloquially known as the Old Worse & Worse line. Next came the Bourton-on-the-Water Railway which ran from Kingham to Bourton-on-the-Water and was opened in 1862. Thirdly, by 1881 the line had been extended from Bourton-on-the-Water to Cheltenham (giving an alternative route to London). Fourthly, by 1887 the line had been completed from Chipping Norton to King’s Sutton (which connected with the Great Western Oxford to Banbury line). Together these four sections of railway formed a complete line between Cheltenham and King’s Sutton (with running rights on to Banbury) and were known as the Banbury and Cheltenham Direct Railway (BCDR). The stations along this line were Banbury, King’s Sutton, Adderbury, Milton Halt, Bloxham, Hook Norton, Rollright Halt, Chipping Norton, Sarsden Halt, Kingham, Stow-on-the-Wold, Bourton-on-the-Water, Notgrove, Andoversford, Charlton Kings, Cheltenham South and Leckhampton, and Cheltenham St. James’. The BCDR Company did not operate services on the line; it contracted the Great Western Railway to do so in return for a share of the receipts. 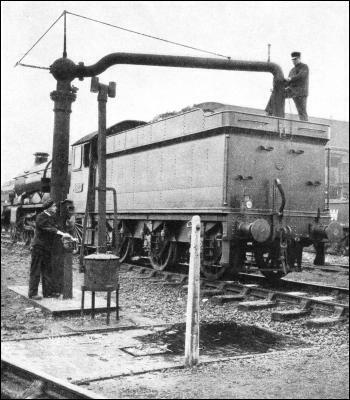 The BCDR remained a separate company until the GWR absorbed it in 1897. All services along the BCDR used to have to change directions at Kingham until 1906, when the GWR built a loop over the OW&W line that by-passed the station. In 1891 the Midland and South Western Junction Railway built a junction with the BCDR at Andoversford, where their station was called Andoversford and Dowdeswell until later, when the GWR allowed “foreign” lines to use Andoversford station. The M&SWJR paid for running rights on the BCDR between Andoversford and Cheltenham. This line ran from Andoversford to Swindon and Andover and had a station at Watermoor for Cirencester. At Andover the M&SWJR connected with the Southern Railway from Reading to Salisbury, from which there were connections to Southampton, Bournemouth and Exeter. The Midland Railway which ran from Birmingham to Bristol had not been idle, and branch lines were built from it to Stroud and Nailsworth, with another branch to Dursley and another branch to Thornbury. In 1906 the GWR opened a line from Stratford to Cheltenham which went through Honeybourne with stations at Broadway, Toddington, Winchcombe, Gotherington, Bishop’s Cleeve (Station Road, Woodmancote), Cheltenham Race Course, Cheltenham High Street Halt and Cheltenham Malvern Road. Then on, parallel to the Midland line, to Gloucester, and then either to Stroud and Swindon for London or, on the Midland line, to Bristol and further south. It was on this line that the famous Cornishman ran from Wolverhampton to Penzance. The intention of this line was to poach traffic from the Midland Railway’s Birmingham to Bristol line. The Great Western line from Cheltenham also had a line that branched off at Gloucester and went to Chepstow and South Wales. Gloucester Central station was on this line after the turn. Gloucester station was on the Birmingham to Bristol section by the Tuffley loop (not to be confused with the terminal station that had been on the B&GR). After rationalisation Gloucester station was re-named Gloucester Eastgate station on 17th September 1951 to avoid confusion with Gloucester Central station. There was a footbridge that connected Gloucester Eastgate station with Gloucester Central station. Gloucester Eastgate station and the Tuffley loop were closed on 1st December 1975 to reduce the amount of maintenance required and to help the road lobby by removing four level crossings. The Birmingham to Bristol line now goes straight from the North or Barnwood Junction, where the lines diverged to go into Gloucester, to the South or Millstream Junction, where the lines come out of Gloucester, completely by-passing the old station area. After the closure of the Eastgate station all trains that stopped at Gloucester had to go to the Central station, which meant that the engine of trains to and from Swindon and also those going to and from Bristol or Birmingham had to run around the train at Gloucester and pull the train back on to the main line. This was alleviated when the InterCity125 Diesel trains or Diesel-electric Class 220 trains, or similar, were built with a driver’s cabin at both ends, but even then it was a waste of time and Virgin trains refused to stop at Gloucester on their way from Bristol to Birmingham or vice-versa. Gloucester Central has now been re-named just Gloucester. A modern suggestion is to build a station north of the North or Barnwood Junction near the Elmbridge roundabout on the A40, then Bristol trains could stop there, but it would be well outside the centre of the city. In 1923 the railways in Britain were grouped to give just the London & North Eastern Railway (LNER), the London Midland & Scottish Railway (LMS), the Southern Railway (SR) and the Great Western Railway (GWR). In 1948 these four companies were nationalised and were called British Railways, which was later condensed to British Rail (BR). In 1951 British Railways withdrew passenger services between Chipping Norton and King’s Sutton and closed all intermediate passenger stations on that section of line. In 1958 a landslide at Hook Norton caused freight services to be discontinued between Hook Norton and Chipping Norton. In 1963 Dr. Richard Beeching’s report The Reshaping of British Railways recommended the withdrawal of passenger services between Cheltenham and Chipping Norton. BR had withdrawn all passenger services between Cheltenham and Kingham on 15 October 1962 and between Kingham and Chipping Norton on 1 December 1962 and all freight services on 7 September 1964. The Honeybourne line was closed to passenger traffic on 5th March 1960, and closed completely after a freight train was de-railed at Chicken curve near Winchcombe on 25th August 1976. The Gloucestershire and Warwickshire Steam Railway Company was formed in 1981 with the intention of re-opening the old Honeybourne line from Cheltenham Race Course station to Broadway. The first ¼ mile of track was opened to the public in 1984 and by March 2016 they had completed the line from Cheltenham Race Course through Toddington to within 1 mile of Broadway, with the headquarters at Toddington and with Broadway station almost completely rebuilt ready for the track to arrive. The “Cheltenham Flyer” of the Great Western Railway marks a stage in railway history. For some years this famous express held the unchallenged title to be the world’s fastest train. 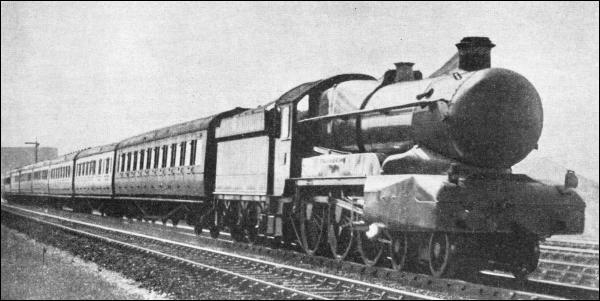 Even when Diesel propulsion in Germany had wrested the “blue riband” of speed from Great Britain for the fastest railway run from start to stop, the supremacy for steam still remained in Great Western hands with the 71.4-miles-per-hour run of the “Cheltenham Flyer.” Now, however, the run has at length suffered eclipse by reason of accelerations on the Pennsylvania Railroad of America, which as described on the page, Speed Trains of North America, have produced a start-to-stop journey at 75.5 miles per hour. But we may expect that eventually the Great Western Railway will cut the Swindon-Paddington schedule down to the even hour – the 77.3 miles have been covered in several minutes less than this, as will be described later – and so, with a start-to-stop booking at 77.3 miles per hour, will restore the laurels for steam to Great Britain. The “Cheltenham Flyer” now has a Great Western rival in the “Bristolian” service, which was introduced in September, 1935, as a celebration of the G.W. R. centenary. The down express, leaving Paddington at 10 a.m., is booked to cover the 118.3 miles to Bristol via Bath in 105 minutes, and the return train, leaving Bristol at 4-30 p.m. and travelling via Badminton – a distance of 117.6 miles – is allowed the same time. The up express is allowed only 62½ minutes from passing Swindon to Paddington, which is 2½ minutes less than the time of the “Cheltenham Flyer,” but as the latter has to start from rest, the two schedules are virtually identical over this distance. It is only over the main line from Swindon to Paddington that the “Cheltenham Flyer” can be said really to “fly.” From Cheltenham to Swindon the distance of 44¼ miles requires 71 minutes, an average of 37 miles per hour – somewhat short of express speed. Among the principal reasons are the stops at Cheltenham (Malvern Road), Gloucester, Stroud and Kemble, and the very steep climb up through the Cotswolds to Sapperton Tunnel. At Swindon, however, Brunel’s original main line is reached. From there to Paddington the gradients are almost exclusively in favour of the engine, and there are no speed reductions whatever, so that the course is with little doubt the best that Great Britain offers for railway speed exploits. “MANORBIER CASTLE,” experimentally streamlined, hauling the “Cheltenham Flyer” near Sonning Cutting, Berks. The locomotive has four cylinders 16 in. by 28 in., coupled wheels 8 ft. 8-1/2 in. diameter, a total heating surface, including superheater, of 2,312 sq. ft., and a boiler pressure of 225 lb. The tractive effort is 31,625 lb. In the year 1923 the Great Western Railway decided to cut the Swindon-Paddington time of an afternoon express from Cheltenham to London down to the then unprecedented time of 75 minutes. Until then the honours for speed in the British Empire had been shared by two runs on the L.N.E.R. One of these was over the 44.1 miles from Darlington to York in 43 minutes, an institution of the former North Eastern Railway, and the other was on the Great Central Section over the 22.5 miles from Leicester to Arkwright Street Station at Nottingham in 22 minutes. Both these journeys worked out at 61.5 miles per hour, with a tractional advantage in favour of the former. But the new 75-minutes run from Swindon beat the two L.N.E.R. competitors by introducing a timing at 61.8 miles per hour. There were runs on the Continent, however, which were superior in speed to this, and for many years before the war of 1914-18 the 50-minutes journey from Camden to Atlantic City of the then Philadelphia and Reading Railroad – over 55½ miles of line – had, with its scheduled average of 66.6 miles an hour, set a considerably higher standard of speed. In 1929, therefore, a second cut was made in the timing of the “Cheltenham Flyer,” and the time allowance from Swindon to Paddington came down to 70 minutes. This raised the start-to-stop speed to 66.3 miles an hour. So the G.W.R. then possessed the fastest booked run in the world, as the Camden-Atlantic City run did not reappear after the war in its prewar 50-minutes timing. Matters remained thus until a new speed challenge came from Canada, which until that time had shown no high-speed tendencies. Competition between the Canadian National and Canadian Pacific Railways for the traffic between Montreal and Toronto finally produced, in 1931, two world’s record timings of Canadian Pacific trains. Over the 124 miles between Montreal West and Smith’s Falls schedules of 109 minutes westbound and 108 minutes eastbound were instituted, requiring start-to-stop averages of 68.3 and 68.9 miles an hour respectively. This the Great Western Railway countered, in September, 1931, by further cutting the “Cheltenham Flyer’s” Swindon-Paddington timing to 67 minutes, and so raising the average speed to 69.2 miles per hour. 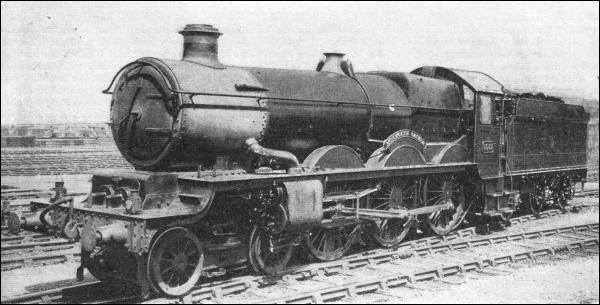 “MONMOUTH CASTLE.” One of the ten new “Castle” class engines constructed in 1935 at the Great Western Railway’s Swindon works. They were brought into service for the summer traffic. Locomotives of this class are generally used for the haulage of the “Cheltenham Flyer,” and are stationed for the purpose at Old Oak Common engine sheds. They work the 10.45 a.m. from Paddington to Gloucester, and return with the “Flyer”—a round trip of 228 miles. A considerable variety of both engines and crews is used on this duty. Almost invariably the engine employed is of the four-cylinder 4-6-0 “Castle” class. It may be wondered why a “King” is not found on this train; but, for sustained high speed with a moderate load, a “Castle” is undoubtedly the ideal engine. The “Kings” have been designed for the heavy trains and steep gradients of the West of England and Birmingham main lines, where their higher tractive power is developed to better advantage. No engine is exclusively allotted to the “Cheltenham Flyer” run, but a considerable variety of “Castles” and of engine-crews find their way on to this train, and competition is at times keen as to who can make the best speeds. THE WORLD’S FASTEST STEAM TRAIN in regular service from 1932 until 1935 was the “Cheltenham Flyer.” This picture shows the celebrated express passing through Slough, Bucks, at speed. On a normal run the highest speeds—anything from eighty to eighty-five miles an hour—are generally reached near Steventon which is 56-1/2 miles from Paddington, and at Slough, a distance of 18-1/2 miles from Paddington. The first constituent of the train to get under way is the through coach from Hereford, which leaves that Cathedral City at 1-15 p.m., and is brought along the Wye Valley through Ross to Gloucester by a “slow,” calling at all stations, and taking 70 minutes for the 30-miles run. At Gloucester this coach is attached to the rear of the restaurant car, which is waiting in readiness. Meanwhile, the “Cheltenham Flyer” proper, normally consisting of a third-class brake, a bogie third-class coach, two first- and third-class composites, and another third-class brake, has left the terminal St. James’ Station at Cheltenham at 2-40 p.m.
Paradoxically enough, the train begins its journey in a direction which is exactly the opposite of that in which it really wishes to travel. This first stage is west-south-west, in the direction of Gloucester. The train stops at Malvern Road, Cheltenham, at 2-42 p.m. At Lansdown Junction it passes on to the seven miles of line which are jointly owned by the Great Western and L.M.S. Railways – a very busy section which forms part of the L.M.S. West of England main line to Bath and Bristol. The Cheltenham section of the train runs into Gloucester Station at 2-53 p.m. Here the engine that has brought the five coaches from Cheltenham is detached, and the restaurant car and Hereford coach are pushed on to what was the leading end of the train, but has now become the rear, for the direction of the train is here reversed, and it leaves the same end of the station as that by which it has entered. This is a geographical curiosity for momentarily the G.W.R. train leaving Gloucester can meet, running in the opposite direction, an L.M.S. express for the West of England, alongside which in the same direction, it may presently be running. At Gloucester, therefore, the London engine is attached to the “Cheltenham Flyer” and it leaves the station at 2.58 p.m. in a direction due east, changed in less than a mile to south-west as it passes round the triangle to resume its previous direction of running. The carriages bear head-boards inscribed “Cheltenham Spa Express,” for, curiously enough, the popular title of “Cheltenham Flyer” never appears in the time-tables and very seldom in any other official announcement. Normally, it consists of seven coaches, weighing 218 tons, but at week-ends and in the busy summer season it may be considerably heavier than this. Soon after leaving Gloucester, the L.M.S. main line, from which the Cheltenham portion diverged at Engine Shed Junction, and which has since passed through the L.M.S. station, appears from the west, and for some miles the two lines now run parallel and closely adjacent. The southbound “Devonian” express is due at just about this hour, and it is recorded that on more than one occasion there has been a race between the two expresses. Indeed, the L.M.S. driver has been known to distinguish himself by beating the “Cheltenham Flyer” along this stretch. This is, however, a rare occurrence. PREPARING FOR THE RUN. “Castle” engines are generally employed for hauling the “Cheltenham Flyer.” Above is the “Trematon Castle” taking water. The “Castle” engines were formerly equipped with tenders of 3,500 gallons capacity, but the latest tenders carry 4,500 gallons. These new tenders no longer bear the Great Western Railway coat-of-arms. The “Flyer” also picks up water from the track-troughs at Goring-on-Thames. At Standish Junction this friendly rivalry comes to an end, for the Great Western line – which, incidentally, forms a part of Brunel’s original and very circuitous main line to South Wales, round the head of the Severn Estuary at Gloucester – turns eastward into the Cotswold Hills, while the L.M.S. continues southwards. Over the latter, however, regular Great Western services run at various hours of the day. 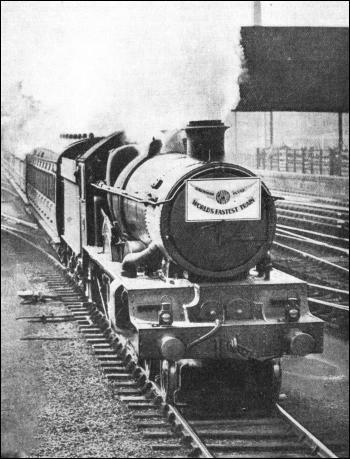 The Great Western Railway exercises “running powers” over L.M.S. metals from Standish Junction – where there is a cross-over connection between the two pairs of tracks – to Yate, and uses this route for its express trains between Birmingham, Bristol and the West of England. So all the express services of both L.M.S. and G.W. Companies from Birmingham to Bristol use the same lines from Lansdown Junction, Cheltenham, to Engine Shed Junction, Gloucester, and again from Standish Junction to Yate – twenty miles in all. The valley through which the “Cheltenham Flyer” now runs is industrial and thickly populated. Stonehouse comes first; then Stroud, at which the train stops from 3-14 to 3-16 pm. and then Brimscombe. All these places are practically joined together. By Brimscombe, the valley, with its steep sides, has closed right in, and the railway now begins to climb. For three miles the gradient is as steep as 1 in 60 to 75, while the railway mounts higher and higher up the side of the valley through some fine wooded scenery. Finally, the line turns inwards at Frampton Crossing, and enters Sapperton Tunnel. This bore is now shorter than it once was; in earlier days the centre portion of the tunnel collapsed, and was subsequently opened out into a cutting, so that the tunnel is now in two parts, with a stretch of daylight between. The longer section is 1,860 yards from portal to portal, and on a rising gradient of 1 in 90. At the summit of the ascent the train reaches Sapperton Sidings, and little but downhill or level now lies ahead all the way to London. A stop is made at Kemble from 3-33 to 3-35 p.m. where connection is made with the Cirencester and Tetbury branch trains, and from there a smart run is made over the 13¾ miles to Swindon in 16 minutes, start-to-stop, quite possibly with a maximum speed up to 75 miles an hour. Rounding the sharp curve through the locomotive works, the “Cheltenham Flyer” draws up at Swindon at 3-51 p.m. Departure for London is timed at 3-55 p.m.
Paddington is roughly 300 feet lower in level than Swindon, and the most pronounced of the modest gradients that make up this difference are found between Swindon and Didcot. From the start at Swindon the line falls at 1 in 834 to Shrivenham, and then at between 1 in 754 and 1 in 880 from there to Didcot. The driver loses no time in attaining speed. By the time Shrivenham, 5.7 miles from Swindon, is passed – probably in about seven minutes or slightly less from the dead start – the train should normally be travelling at seventy-five miles an hour. The rate will then gradually increase past Uffington until the “eighty” mark is crossed somewhere in the region of Challow or Wantage Road. On many runs the speed will hover round, or generally slightly above, eighty miles an hour for the major part of the journey. DEPARTURE FROM SWINDON. The “Cheltenham Flyer,” hauled by “Launceston Castle,” bound for London. The express is scheduled to cover the 77.3 miles to Paddington at an average speed of 71.4 miles an hour; it is only over this section of the journey that the trains travel at a very high speed. On a record run in 1932 the Swindon-Paddington stretch was accomplished at an average start-to-stop speed of 81.68 miles an hour. But the best thrills are reserved for the days when the train has left Swindon late, and a driver who is keen on showing off the paces of his steed lengthens his cut-off a notch or two. Then the eighty mark gets left well behind, and the observer notes the speed gradually mounting until by Steventon it has reached eighty-seven, eighty-eight, or, on comparatively rare occasions, even the coveted ninety miles per hour maximum. Very efficient locomotive work is needed to achieve and to maintain such high speeds with little or no assistance from gravity. It is not merely the matter of getting the steam into the cylinder with such lightning rapidity, but the even more important matter of getting it out again. This is where the wisdom of Swindon locomotive designing methods finds such striking proof. Long valve-travels and short cut-offs, which have been standard in Swindon practice for thirty years past, reduce back-pressure in the cylinders almost to vanishing point. This enables the engine to be worked with the regulator fully open, so that there is no throttling of the steam as it enters the steam pipe, and the expansive properties of its pressure may be used to the fullest advantage. 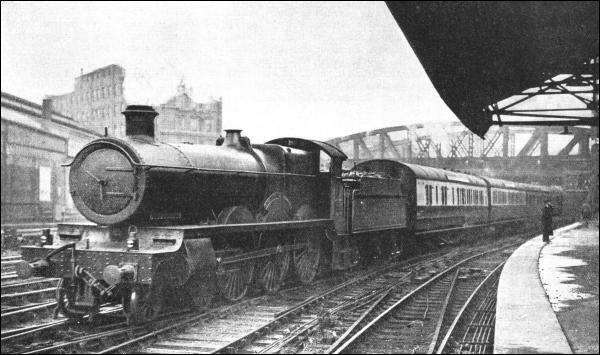 No engines in existence in Great Britain run with more freedom at high speed than the Great Western “Castles,” and there are probably but few other express locomotive classes in Great Britain that could have maintained so consistent a time-keeping record on this service as the “Castles” have done. The point-to-point timings of the “Cheltenham Flyer” from Steventon onwards demand average speeds in excess of eighty miles an hour. The fastest stretch is from Steventon to Slough, where thirty-eight miles are booked to be covered in twenty-eight and a half minutes, at an average of exactly eighty miles an hour throughout. From Didcot onwards the line flattens out, and the steepest grade subsequently is no more than 1 in 1,320, or four feet to the mile. Speed usually drops slightly between Goring, Pangbourne and Tilehurst, partly because of the resistance of taking water from Goring track-troughs, and partly from frictional resistance as the express negotiates the reverse curves bordering on the River Thames in the neighbourhood of Pangbourne. But only two or three miles an hour are dropped from the ruling speed; by Reading the train is travelling again at round about the eighty-miles-an-hour mark. The value of the movable diamond crossings in the track is fully appreciated as the “Cheltenham Flyer” cuts through the intricate points and crossings at the west end of Reading Station, with not the slightest jolting or discomfort to passengers. Speed continues to rule high while running through Twyford and Maidenhead, and the slight descent, though no more than four feet to the mile, to Slough, may produce another maximum of anything from eighty-three to eighty-six miles an hour or so. On a normal run the highest speeds may be anticipated at Steventon and Slough. Speed may fall slightly below eighty miles an hour onwards through West Drayton and Hayes to Southall, but if the train is behind time, there will now be some slight acceleration, and given, as usually happens, a clear road, the driver will continue at full speed – probably at over eighty miles an hour again – through Ealing and Acton until he is approaching the great gasometers near Westbourne Park, where steam will be shut off. Brakes will be applied to reduce the speed to not more than fifty miles an hour through Westbourne Park Station, and more vigorously afterwards, but it is practicable to run the 1.3 miles from here to the dead stand in the terminus, with perfect safety and smoothness, in just over two minutes, if necessary, thus making possible a very smart stop. So the “Cheltenham Flyer” comes to rest at Paddington, and the chances are that the time of arrival is on the stroke of five o’clock. In two miles from the start “Tregenna Castle” was travelling at sixty-four and a-half miles an hour, four miles from starting the rate had increased to seventy-five; and somewhere about five and a quarter miles from Swindon the “eighty” line was first crossed – a remarkable exit. For seventy miles continuously the speed never fell below eighty miles an hour. From Shrivenham it continued gradually to increase until ninety miles an hour was reached at Didcot, and, finally, an absolute maximum of 92.3 miles an hour through Goring Station. For twenty eight miles continuously an average of ninety miles per hour was maintained. In these days, of course, ninety miles per hour is no longer an outstanding speed, but the point of this Great Western run was the maintenance of such tremendously fast travelling on level track, as compared with the falling gradients on which these other momentary feats of speed are usually achieved. Two miles out of Paddington the train was still travelling at eighty-two and a-half miles an hour, steam was then shut off, and the train was brought smartly but smoothly to rest at Paddington fifty-six minutes forty-seven seconds after leaving Swindon, seventy-seven miles twenty-four chains away. Over certain sections of the journey even quicker times have since been achieved, and on a number of occasions the run has been made in an hour, or slightly over, which proves that if the Great Western Railway decided to put a sixty-minute timing over the 77.3 miles from Swindon to Paddington, given a strict limitation of the maximum load of train to, say, seven or eight coaches, it could probably be observed regularly even with existing locomotives. As previously mentioned, such an acceleration would restore to the Great Western Railway the world steam supremacy. STARTING THE JOURNEY. The “Cheltenham Flyer” is the popular name for the “Cheltenham Spa Express,” which daily leaves Cheltenham for Paddington at 2.40 p.m. and covers the last stretch of the journey from Swindon at 71.4 miles an hour. Above is a photograph of a Cheltenham express outside Paddington Station. I was so pleased to see the ex Henley in Arden Footbridge Span being put in place at Broadway earlier this month. The acquisition of the footbridge from HIA has a story worthy of a Martin Amis novel. Nevertheless, despite the deterioration it suffered from the elements, consigning much of it to scrap, the re furbished centre span now sits in pride of place at Broadway – a replica of what was there before. The dogged determination of a small group of BAG volunteers to keep the project going, is a credit to them. I cannot wait to see the footbridge completed – it is the structure that locks all of the other elements of Broadway Station together. Brilliant! This is why we take security so seriously at CRC, luckily this theft had a happy ending, I only hope that Broadway do not have a similar problem in the future. 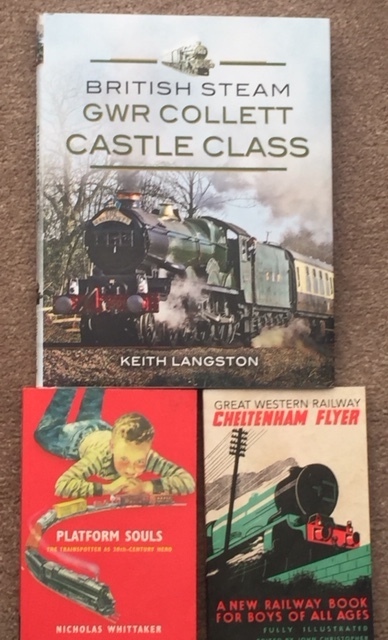 When I wrote the brief article “The Memoirs of a Trainspotter” for the Woodmancote News, I really did not envisage the number of nostalgic memories it would generate amongst railway fans! My own interest in railways became serious after leaving school when I was accepted as a British Railways Traffic Apprentice. This was subject to a medical by the Western Region’s Doctor Stallman in Gloucester where I attended on the appointed day. After a good check, he seemed happy, remarking “There’s just one other thing I need to do” and produced a large book which when opened displayed coloured images on the various pages. These images were numbers. I turned over the pages and told him the numbers I could see and he nodded his approval until further on when he looked concerned. My answers to some of the pages had evidently indicated colour blindness! He apologized, breaking the news that my Traffic Apprenticeship was now out of the question. I then pursued another career and eventually ended up in new retail car distribution. All was not lost though because I was invited to join the board of the Gloucestershire Warwickshire Railway, which in those days in the early 80’s was chaired by Tim Bazeley. I then attended board meetings in the railway carriage “boardroom” at Toddington, some of which could go on fairly late. In due course I regretfully had to resign in order to set up a new BMW dealership which took a considerable amount of my time. In due course we moved to Woodmancote from Bishop’s Cleeve. Imagine my delight later on when it was confirmed that steam was going to run again, just a short distance from where I lived! Now some years on, the railway is expanding and has become a massive success but only due to the devoted enthusiasts throughout who are involved in it. They greatly deserve their success and good luck to them in the future. Broadway, onwards and up! Who knows? Back in the 1950s when I was a bit younger, the railway industry was struggling to get back on its feet after the years of the Second World War, when both its locomotives and rolling had been heavily used with the minimum amount of maintenance. In the fifties, young lads like me and my friends, John and Richard, were railway mad, spending every available minute at local railway bridges or stations. t Leckhampton and Charlton Kings stations. During this period, British Railways introduced a special promotional offer “The Holiday Runabout” ticket. This cost the mighty sum of ten shillings and sixpence! (in current money, fifty two and a half pence) and lasted for seven days. The ticket could be used non-stop and took us to various limits as far as Swindon, Leamington and down to the Forest of Dean. This meant that our parents never saw us for all that week except at supper time! As with all our daily excursions during the holidays we had a satchel complete with sandwiches, Smiths Crisps (with the little blue bag of salt), a Mars bar and a bottle of Tizer! Another regular outing for Gloucestershire enthusiasts was the Wednesday afternoon tour of Swindon Railway Works. A queue formed along the main street by the works ending at the small entrance. At the appropriate time we were then escorted through the gate and down the tunnel under the main line, emerging on the far side at the works In crocodile formation would then be taken through the various sections of the works, still busily taking numbers of the locomotives that we had never seen before The noise, heat and smell in the works was one that I shall never forget, with giant Castle Class locomotives being hauled high up on gantries to another section of the works. Further on was the “Rolling Road”where a King Class locomotive would be clattering along at the equivalent of sixty miles an hour while engineers tested and recorded various elements. Eventually we reached the Carriage and Wagon section back into the yard number of gleaming engines stood in prime condition, having just been completely reconditioned throughout. Alongside were some newly built GWR engines yet to go into service as well, which was a real scoop for many of us! I suppose that in its day you could say that Swindon GWR was the equivalent of the modern day Japanese car plant because it had its own employee housing, social facilities, centre and training school. If you went to work for the GWR you were there for life, unlike many companies. My days as a train spotter with memories of sunny holidays out in the open air along with my good friends enjoying what was to us the best hobby in the world. Even now the smell.Even north smell of burning oil and Welsh coal brings back those wonderful memories which will never go away. I wonder if this article has rung a bell for any of you. If so, why not share the days of your youth with readers!